Children and carers doing craft at Toddler Time. 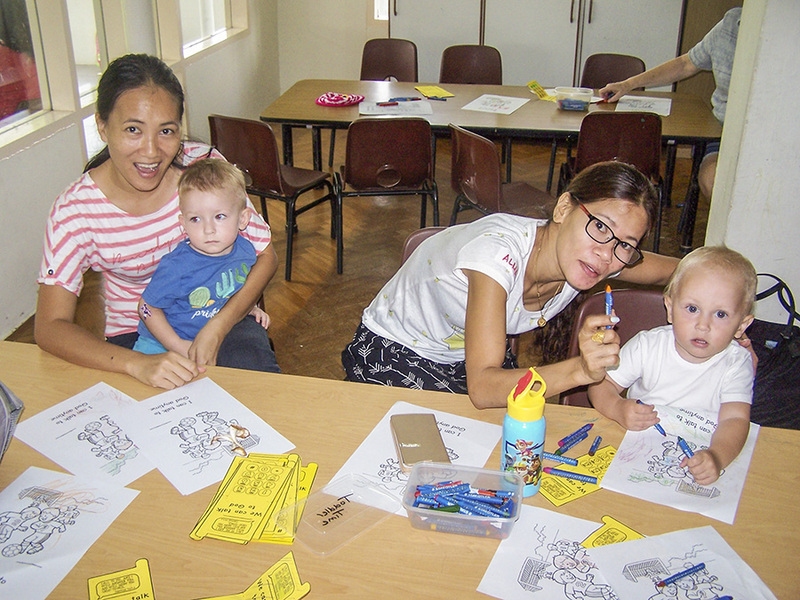 CMS missionary Rosemary Dickens (serving with Mark at St Georges International Anglican Church in Singapore) meets domestic workers through events like Toddler Time, where as many as 150 carers are involved. Here, Rosemary shares Luisa’s story. Luisa is from the Philippines but has worked in Singapore for 26 years as a live-in domestic helper. During that time she has worked with six different families. Gospel opportunities abound. Rosemary: Why do Filipinas come to Singapore to work as domestic helpers? Luisa: For myself, I finished college back at home but after two years, I still had no work. This is why I came here to do domestic work. At first I needed to pay off debts [related to the agency which brought her here]. But then I liked it so I stayed. Rosemary: What are some of the challenges that domestic helpers face here in Singapore? Luisa: How the boss treats them. A relationship of trust is very important. We do our best but we can’t please everyone. Some employers are not appreciative and we don’t know what they want. The relationship with the kids in the family is also important. Some helpers face abuse. Rosemary: We first met through the ‘Coffee & Bible’ group back in 2015. There were 11 sessions and you attended every one. What inspired you to keep coming back? Luisa: I didn’t read the Bible and I wanted to experience it. I used to learn the Bible in school but it’s different when you’re sharing together in a Bible study. Rosemary: After that, you joined the Toddler Time team and started serving in this ministry with us, thanks also to your supportive and godly employer. This ministry is very popular with the helper ladies. Why do you think they enjoy coming along? Luisa: They enjoy making friends, but they also like to teach the children (whom they look after) about Jesus. Often their employers don’t go to church. Toddler Time helps the ladies to interact with the children about Jesus. Pray that God would open up doors of opportunity for the gospel amongst the families that the domestic helpers work with. Thank God for the many chances to share with children who are in their care.